Four days later, I begin to wonder whether psychological wounds could be the culprit causing cell disturbances in my body. The idea seems to go around and around in my mind, triggered by a book an acquaintance suggested I buy. The small, orange book, entitled The Dynamic Laws of Prosperity,prompts me to consider the connection between our thoughts and physical conditions. According to this non-denominational, metaphysical approach to the Bible what we radiate we attract. Changing our thoughts can change our lives. The people at work are here. Definitely my co-worker Freda is here. On her desk is an amaryllis plant. I wish I could afford flowers. At least I can enjoy hers. 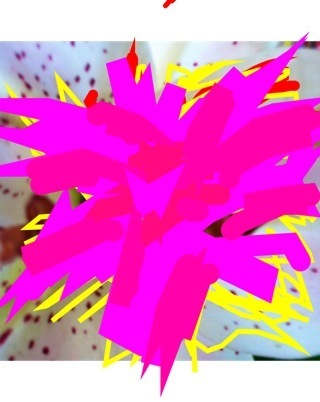 They are so pink, vibrantly pink. I try to feign a normal day-to-day routine. I continue to talk with my actor friend about the screenplay we are writing together. It’s called Real Dreams, and we hope to produce it at some point. I wake up in an operating room. No, it’s a kitchen. I put a big wire whisk in the center of a silver flower. No, it’s a cookie cutter — a metal container. Only recently does that dream make sense to me. I think I was operating on my consciousness. In effect, I was trying to cut out images from my memory. Finally, I have my visit with the gynecologist, who explains the Pap test results to me. A reading of Class 1 or 2 could be IUD related; Class 3 is suspicious and, with a clump of abnormal cells unlikely to be IUD-related; Class 4 is dangerous; and Class 5 is cancerous. The doctor decides to do another Pap test. For the two weeks until the results come back, fear continually fills my mind. Finally, there is a message for me. The doctor wants me to call him the next morning. “It’s still a Class 3,” he tells me. Still? I want to scream into the phone. He wants to see me the next day to take some scrapings from my cervix and determine the seriousness of the findings. While I’m riding the bus that day, I pull the prosperity book from my purse. It advocates offering a prayer of thanksgiving that one is healed of the affliction and asking God to send help in the appropriate way. I do this even though this God language is foreign to me. “God” was a word in the prayer book we used in Sunday school while I was growing up in central Ohio. I am somewhere and a miracle worker type, like a preacher, performs a miracle on a blindman. I am really impressed and wish that for myself I literally hold him down and I persevere until be performs a miracle on me . . . The next morning I awake feeling calm and dear. For the first time in weeks, the tiredness disappears and I have energy. I arrive at the doctor’s office, and he does the scraping and does yet another Pap test. He explains the medical options available to me if the next test proves to be higher than a Class 3. The options include conization –cutting a triangular area from my reproductive organs–or possibly a hysterectomy. Five days later, I walk in from my morning hike as the phone rings. “How are you?” the doctor asks. “You tell me,” I say, holding my breath. “The tests show you are fine. Some cells were growing faster than they should. That accounts for the Class 3. Come back in three months and we’ll see what, if anything, we need to do,” he says. I feel joyous, elated. Around and around in my brain were the words, “Thank you, God.” Now I could look ahead and plan. All systems were go with my camping trip to Yosemite. Three months later, the Pap test registered Class 2; six months after that, a Class 1. And every Pap test in the six years since then has been Class 1: Normal. I believe that dreams guided my recovery to physical health and became the place where transformation happened. My key dreams retold here provided what I consider to be the diagnosis (bus dream), the choice to be well (amaryllis dream), the surgery (cookie cutter dream), and the cure (the preacher dream). This experience has unquestionably changed my life. It began a process of resolving my long-time fear that, as a woman, I was handicapped-as a woman I could not have a successful career and a happy family life. The seeds of this belief were planted in the house in which I grew up, and I believe society reinforced this attitude. This healing process continues today. I call upon the guiding and healing powers of dreams in every aspect of my life. I record my dreams in a journal, sometimes first talking groggily into a tape recorder. I try to discern the multi-level meanings and apply their messages in my waking life. Dreams empower me to look within myself rather than to outside “authorities” for the answers. This crisis gave me my first experience of God and led me back to my religious heritage. As a result of this healing experience and my subsequent use of dreams, I have come to believe the Divine communicates through dreams. Since the era of ancient Greeks, humankind has called upon the healing powers of dreams. The technological age buried this connection but a renaissance again explores the potentiality of the mind — the dimension where dreams reside. Respected physicians are unveiling this innate source, which communicates in symbolism and imagery. Dr. Gerald Epstein, assistant clinical professor of psychiatry at Mt. Sinai Medical Center in New York City and author of Healing Visualizations: Creating HealthThrough Imagery (Bantam Books, 1989), postulates that imagery-a mental process-produces physiological changes that are non-linear and holographic. A change in the image moves a person toward wholeness, the mental counterpart of what happens in physical healing. “The mind gives instructions to the body as to how to respond,” says Epstein, who also continues a private practice. This was the first time I had used dreams for healing. Dreams appealed to me because they reminded me of short stories I liked to analyze in high school. I used a book on dream theories with a spiritually oriented dictionary (Do you Dream? by Tony Crisp) that I found in a bookstore to acquaint me with dreams. This experience marked my discovery of and entree into using my inner source of well-being. I believe that everyone can use this powerful tool. With their symbols and images, dreams offer a fascinating connection between mind and body and a natural health treatment we can call upon every night. 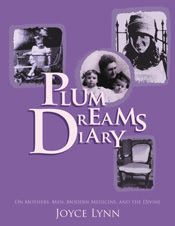 Joyce is a journalist and the author of PLUM DREAMS DIARY; On Mothers, Men, Modern Medicine, and the Divine. Her book on the healing power of dreams will be published in Fall 2014. This entry was posted on Sunday, July 27th, 2014 at 12:00 pm	and is filed under HEALING, Plum Dreams Media. You can follow any responses to this entry through the RSS 2.0 feed. Both comments and pings are currently closed.